Brands on Facebook are slowly beginning to accept the fact that the social network is a pay-to-play platform. 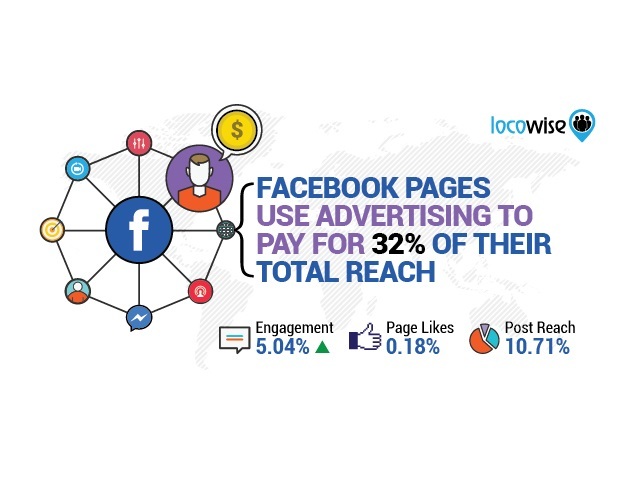 Social analytics and reporting firm Locowise found that 43.28 percent of the 5,000 Facebook pages it studied in April used Facebook advertising, which accounted for 31.68 percent of their total reach. According to Locowise, the levels reached in April marked the highest since it began studying pages on Facebook in May 2015, as well as the highest number of pages using ads since October 2015. Likes growth remained steady compared with March, at 0.18 percent, marking the highest percentage since November 2015. The average post reach was 10.71 percent of total audience, down 6.13 percent from March. Organic reach is actually on the rise, as Locowise found that the first four months of 2016 tallied the highest organic reach since it began its studies. Videos secured the most reach, at 12.17 percent of total audience, followed by photos (11.53 percent), links (9.32 percent) and status updates (5.09 percent). Engagement rose 2.44 percent from March, tallying 5.04 percent of people reached. This figure is up 13.26 percent since reaching its low point in January. Surprisingly, status updates were the most engaging format in April, at 5.4 percent, followed by videos (5.26 percent), photos (5.26 percent) and links (4.11 percent). 0.64 percent of pages’ total audiences engaged with videos, followed by photos (0.61 percent), links (0.38 percent) and status updates (0.27 percent). 50 percent more advertisements were served in 2016 than in 2015, and advertisers are now paying 5 percent more than what they used to last year per ad. Facebook has made 33 percent more money per user this year than it did last year. Facebook is definitely doing its best in order to keep its audience engaged on the platform. This month, we saw the first temporary Reaction on the platform, as Facebook added a flower button for Mother’s Day. We can expect more temporary Reactions to follow for some of the other big events and holidays. Facebook has recognized that actions such as sharing and commenting may not necessarily be the best indicators of what content people want to consume. The News Feed algorithm now predicts how likely you are to click on an article and how long you are likely to spend reading it–all this in order to put more relevant content into your News Feed. Readers: What did you think of Locowise’s Facebook findings for April?